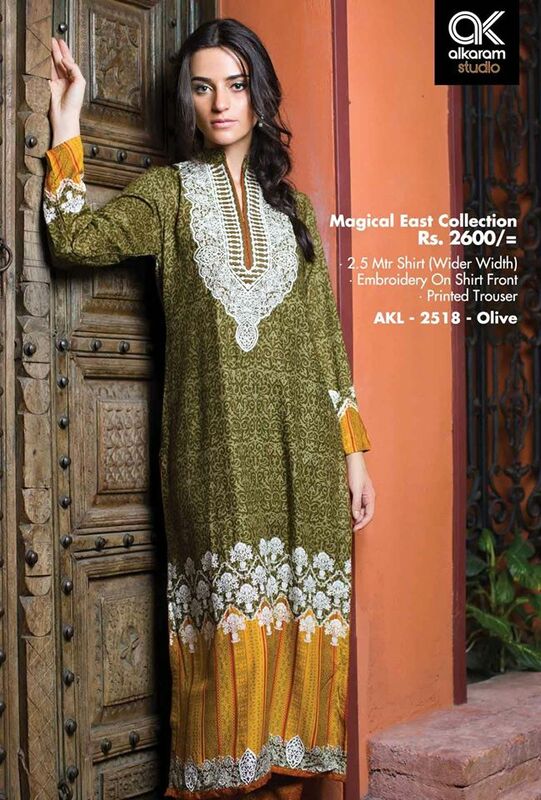 Alkaram is one of the top most fashion hub in Pakistan industry and also one of very oldest brand when we talk about traditional, cultural, formal, semi-formal wear like shalwar kameez and frocks. 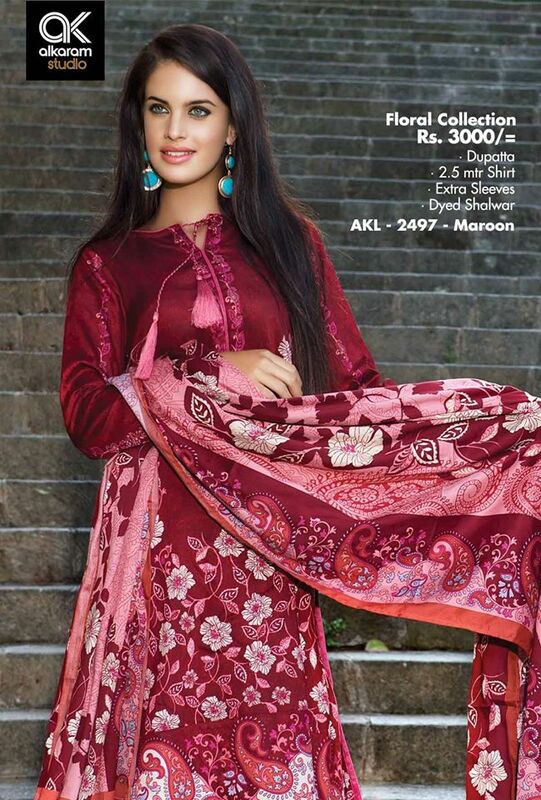 They have very vast variety of stuff for ladies wear, men’s wear and for children’s wear. 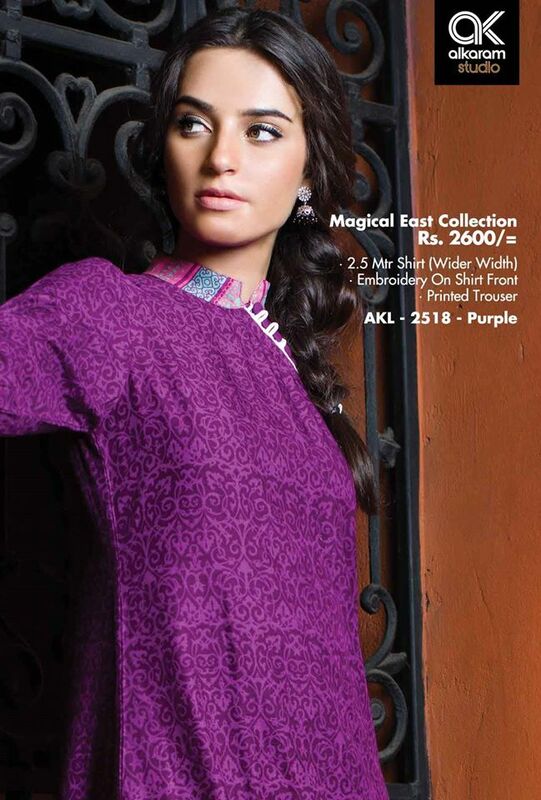 Every year when season comes to change, they surprise their customers by launching stunning collection in high quality fabrics. This year also proved eventful for Alkaram studios, because they have raised bar for themselves to follow this designer dresses. They know very well how to use colors in such way that suits in each season, rather it’s summer or winter and make unique and elegant designs. 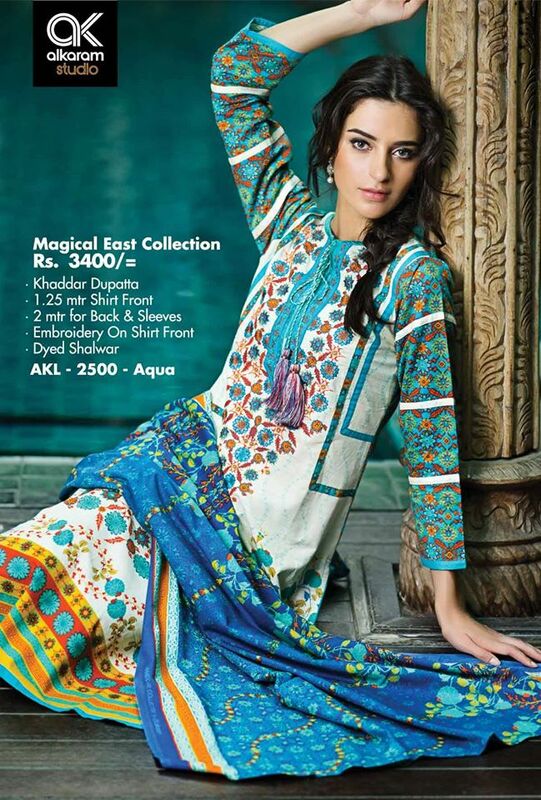 They are one of top brand that people wait for their prints anxiously. 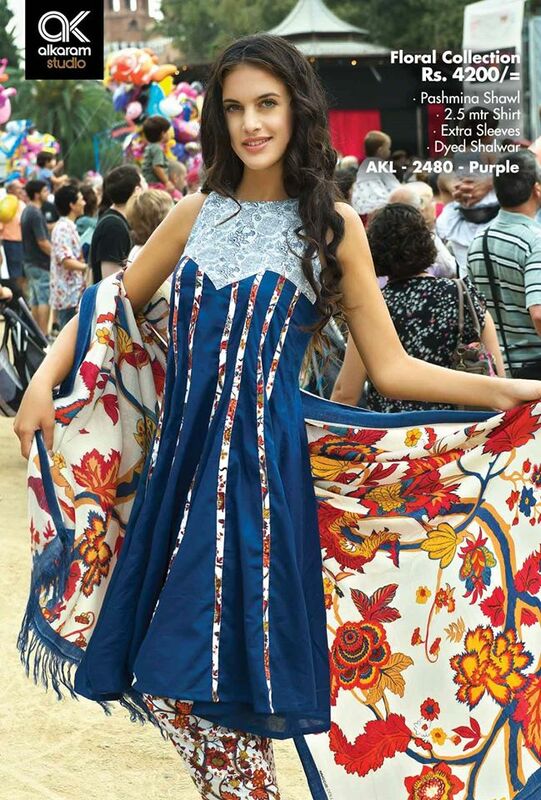 Though, they produce native dress for Pakistani people, but they always add some glimpse of urban fashion also to add vast spectrum of customers and to make their stuff appealing to youngsters who are looking for latest trends. 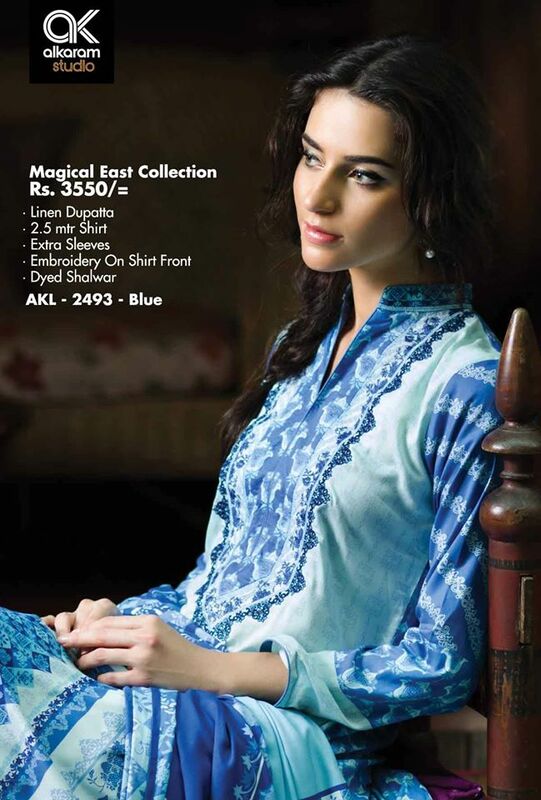 catalog 2015 With price catalog brings some unique and stylish wear for fashionable women. 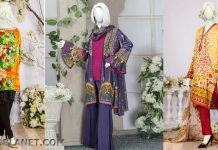 The price of each of these dresses is quite affordable for all.In our fashion blog here are some images of Alkaram Latest fall/winter dresses 2015-2016. 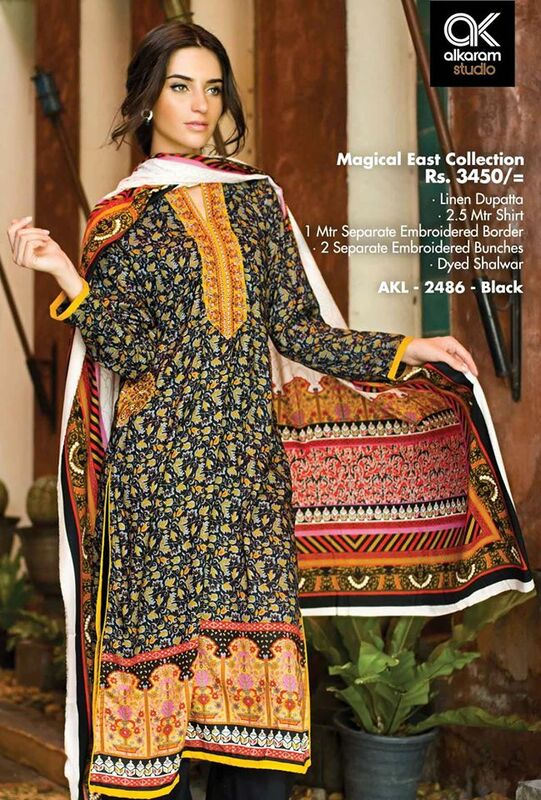 This specific collection basically comprises of four further collections within it named Alkaram winter Digital, Alkaram Mystical Tales, Alkaram Magical East and Alkaram Floral Prints. 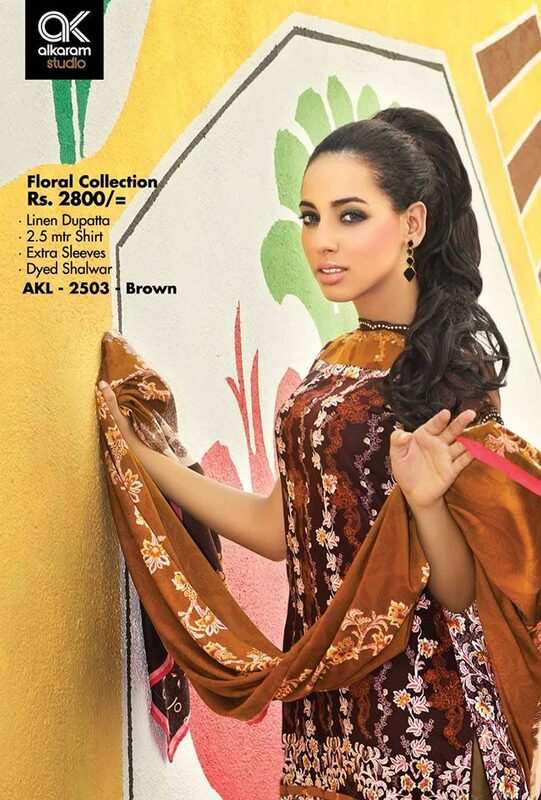 Alkaram Digital collection is designed specifically for such people who love so much patterns and prints. 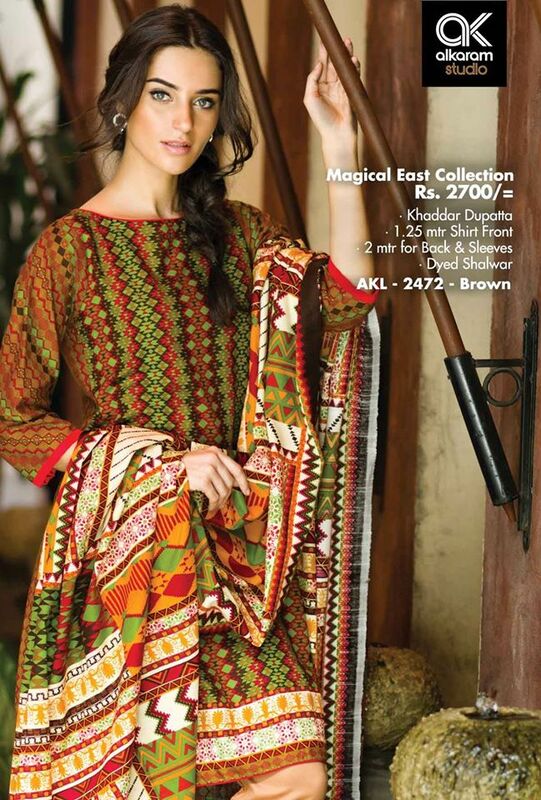 These designs are printed on soothing stuff which is khaddar fabric. 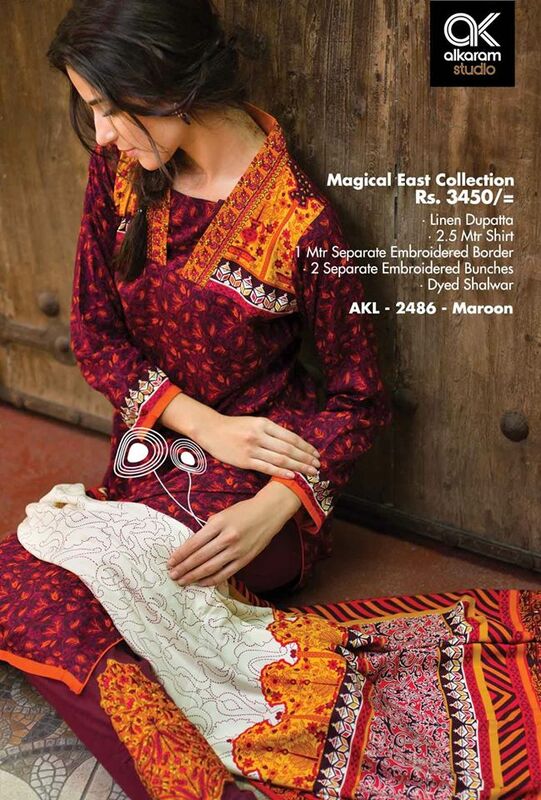 The price of these patterns are from 1300 PKR to 1600 PKR. through floral patterns. 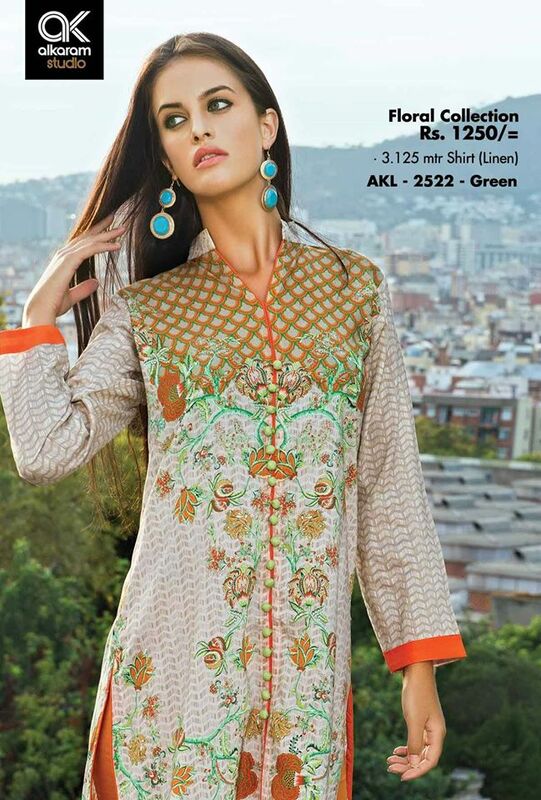 Price range is till PKR Rs 1250/- to PKR Rs 5500/-. 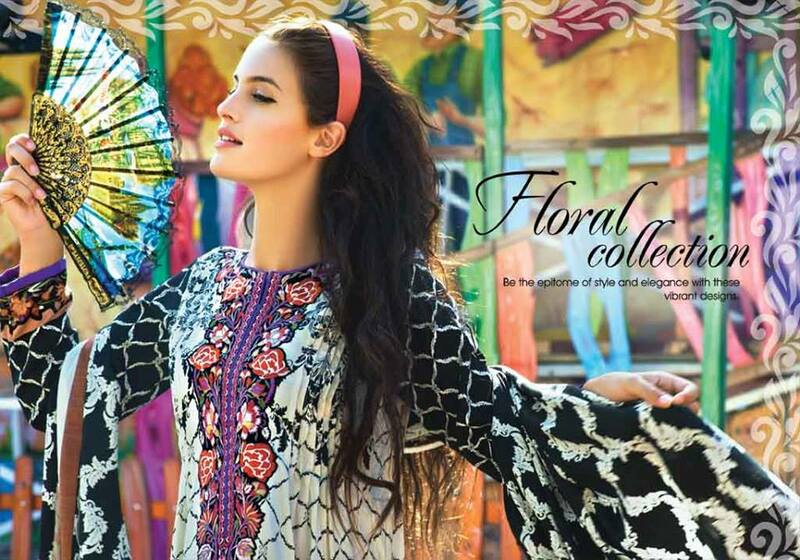 When you wear these floral prints you will feel freshness and lavishness all around. 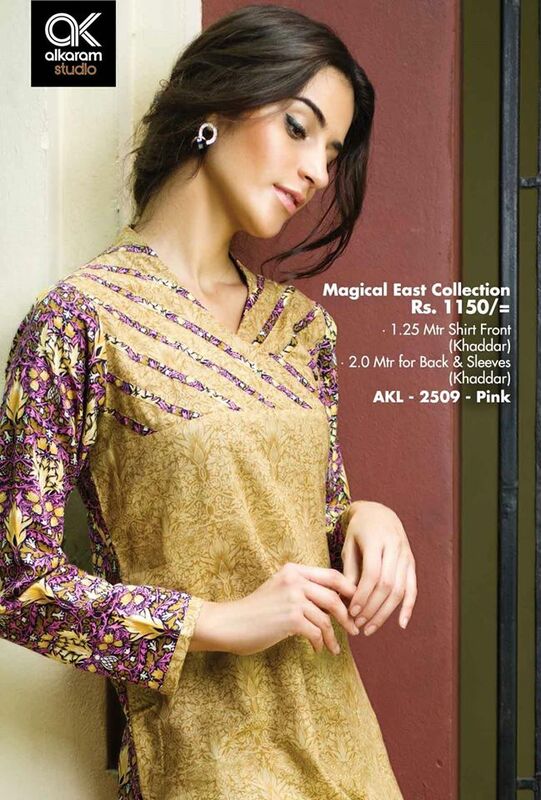 This includes three piece suits paired with pashmina fabric shawls along with embroidered qameez and shalwar. 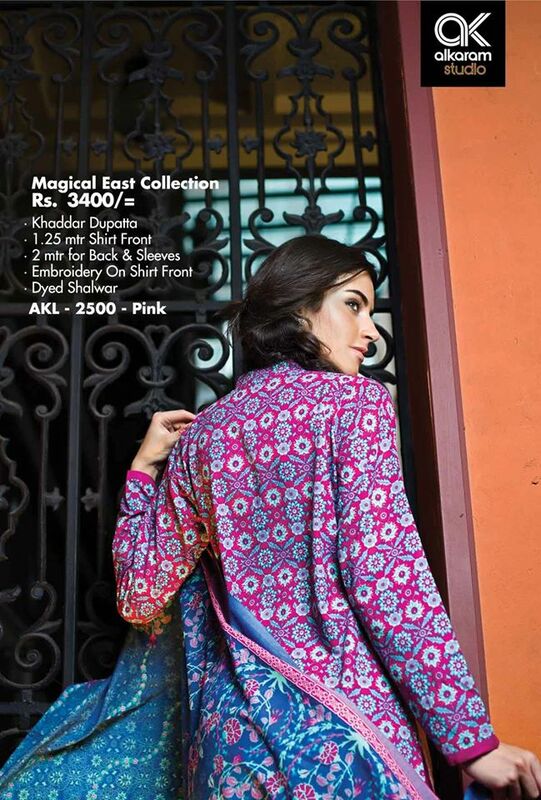 Now we have Magical East which is very chic due to its traditional sense and packed with splendid designs that reflects the showy luxurious trends. All this beauty is created with lovely and lively patterns. 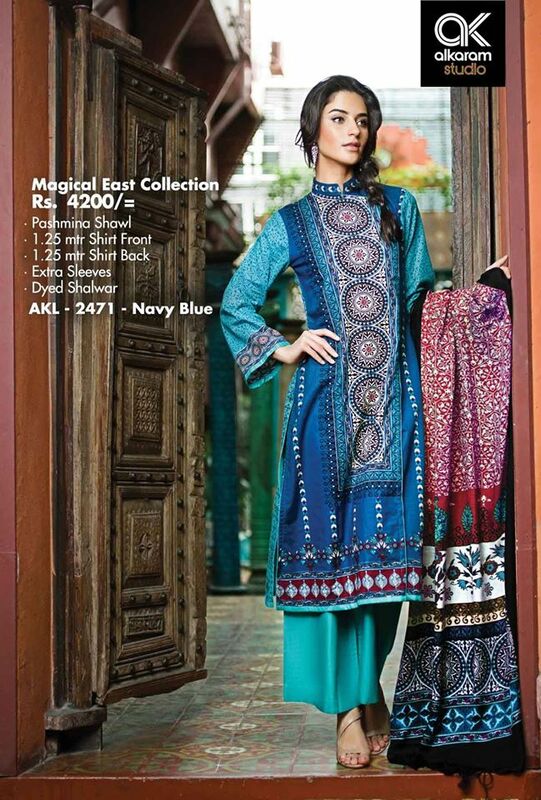 Price range till PKR Rs 2700/- to PKR Rs 4900/-. This collection is very extravagant, refined and elegant. 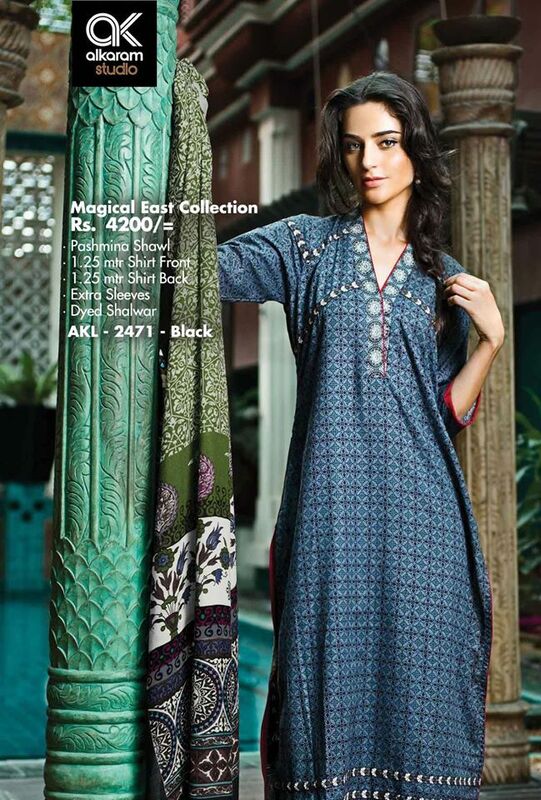 Price is from Rs 1150/- to Rs 4900/-.